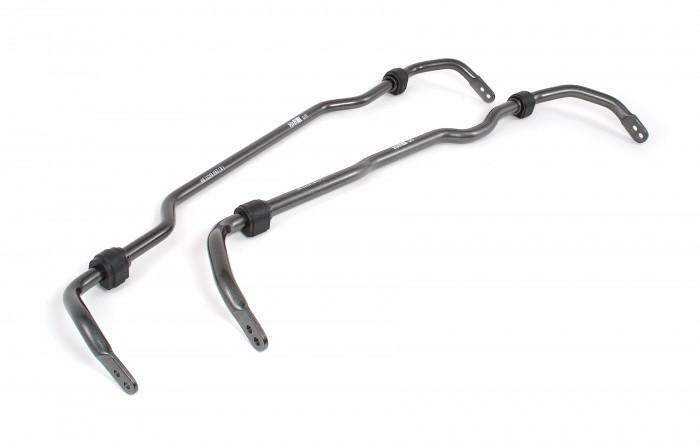 H&R Sway Bars are truly something special in the world of automotive suspension components. Using specialized machines designed by H&R, H&R Sway Bars are formed perfectly for each and every application, ultimately providing an unmatched level of precision fitment and performance. H&R Sway Bars are crafted from a special 50CrV4 steel alloy –– the highest tensile strength available and the industry’s strongest and most durable. The true consistency of this special alloy guarantees smooth transitions in sway bar function. A unique feature of H&R sway bars are the machined-like forged ends that are adjustable for fine-tuning. H&R sway bars come equipped with exclusive Urethane/Teflon composite bushings featuring a molded-in fabric-like material that requires no maintenance or lubrication, and eliminates squeaking. H&R Sway Bars are the perfect compliment to H&R Springs, Coil Overs and Cup Kits. H&R Sway Bars are crafted from a special spring steel that is both stronger and more resilient than competitors sway bars. All H&R Sway Bars are built on specialized machines designed by H&R — the only way to ensure an exact fit and incomparable performance in every application. Each bar is heat-treated and shot-peened — an H&R exclusive process — for increased surface hardness and life. Finally, all H&R Sway Bars are powder coated for long lasting performance, quality and beauty. Like all H&R components, H&R Sway Bars are 100% Made in Germany to exacting ISO 9001 and TÜV Certification standards, guaranteeing the highest quality and best performance.